Yes, we are back from Austin. But, before I jump into the story I have got to document this new phenomenon I experienced at the last tournament. I think they call it nervousness. To be honest, I really had not felt the same sensation since Sydney's treatment days. But there I was sitting in the bleachers waiting for my kids to take center ring and I found myself fidgeting and ringing my fingers. You might think that I was nervous because this was the first official tournament the kiddos would be participating that scored head shots (kicks to the head) but, no, that wasn't it. I knew both of them could handle it and, if I was being honest, I knew they could deal it out if they were told to by their coaches. I also was not nervous about them doing their best. I knew down to my very core that they would give it their absolute all. I knew they would put out 110% effort. That was the one thing I knew for sure. No matter how they scored they would walk out of the ring leaving nothing behind. You see, in all of this not worrying about whether they won or lost, I never considered wow desperately they wanted to win. That strange feeling in the pit of my stomach was not worry about them but, worry for them. I was a nervous nelly. Here, I had been schooled as a professional athlete. I have played in some of the toughest mental games to be played. In my twenties I had carefully honed those skills. I was the master of cool cucumbers everywhere. Following that we went through Sydney's diagnosis. While I can not say I was ever a cool cucumber during that time (I don't know if that is even possible) I did survive the experience, my sanity and marriage in tact. It was quite a feat and evidence of my superior daddly coolness. And yet, here I sat, before my kids in the bleachers quaking in my boots. I was a nervous wreck. How ludicrous. Graham was first. I should tell you that he aced his forms. No one on the mat even came close. Of the 9 kiddos of his age and belt level he was the clear standout. He easily took home the gold. Sydney did well. She was technically right on the money. 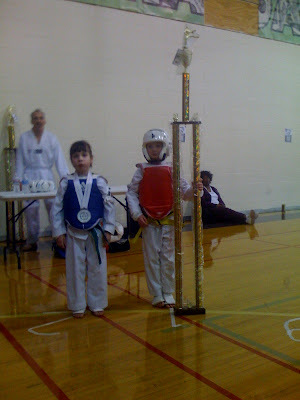 However, the girl right after her showed power like no one else I had seen in their age group. Her technique was not as good as Sydney's but I think everyone was amazed by her power. This gave her the edge and at the end of forms Sydney would take home the silver medal. I had sized up Graham's competition earlier. While it is difficult to tell someone's technical level by their form at his age, I could still tell that Graham had a pretty good chance within this group. As a luck of the draw we received a first round by. In watching the kiddos I was completely surprised by the aggressiveness of this group. It was clear that each and everyone of these kiddos was far better at sparring then they were at their forms. This was my worry for Graham and it would come out when he was sparring. All in all, Graham did a great job, he fought well but he still lacked some of the quick thinking he needed. He is still a bit slow and can not quite put together the plan on the fly. Although we practice several offensive and defensive scenarios, he often gets them mixed up and ends up leaving himself open to attack. I think it is partly his age and I am extremely proud of how far he is coming. He gets better with every fight. He is showing technique which is lacking in most of the other competitors and I think once we can get them ingrained a little more he will be unstoppable. Unfortunately for Graham's sake, he received a silver medal in sparring. It was close but he just missed the big trophy. As they called out the winner you could see the look of dejection on his face. He was heartbroken. After the awards were passed out I received one of those hugs reminiscent of when he was 2 years old and we, his mommy and daddy, were the only things in his world. It was full, tight and complete. I ached for him but, as I told him, he did awesome and their will be more chances for the giant trophy in his future. I was proud. Sydney's was next. Sydney showed true skills in the ring and, while the score did not seem to show it, she was in complete control. She dominated. In the end, she would tie and it would come to sudden death. The fact that they tied came as much as a shock to us as it did to the main referee who looked at the score at the final bell and gasped. His words were - "Oh come on, you have got to be kidding me." I should probably also mention that Sydney also threw 2 head shots, her first in competition. It was sudden death. The first kick landed would score. We could not have been more proud. It is nice to see purpose rewarded. How awesome is this? I know you and Lynley are very proud. Heck, I'm proud and she's not even mine. Boy, I have been bad.